In my quest for recipes using apples I came across this one. I love going to tea and hosting tea parties so I was more than eager to bake these scones. 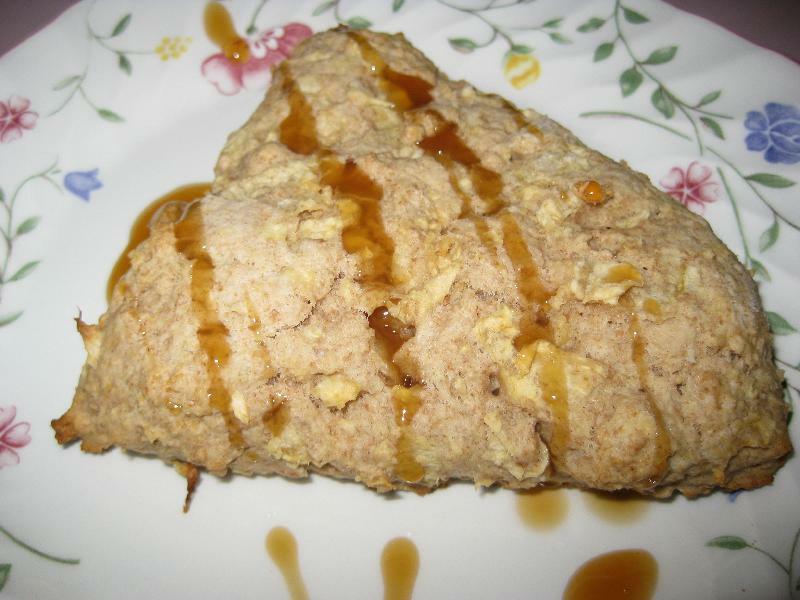 The recipe is from http://www.tasteofhome.com/Recipes/Caramel-Apple-Scones.aspx This recipe also allowed me to use my Kitchen-Aid attachment to shred the apples. I have had the attachment for over four years. In a small bowl, combine the flours, brown sugar, baking powder and salt. Cut in thebutter until mixture resembles coarse crumbs. In a small bowl, whisk the cream, egg yolk and vanilla; add to dry ingredients just until moistened. Turn onto a floured surface; knead 10 times. Pat into a 5-in. circle. Separate wedges and place on an ungreased baking sheet. You could cut these into more wedges instead of four. I also thought that maple syrup might be tasty drizzled over them. Tags: Text: in my quest for recipes using apples i came across this one. i love going to tea and hosting tea parties so i was more than eager to bake these scones. the recipe is from http://www.tasteofhome.com/recipes/caramel-apple-scones.aspx this recipe also allowed me to use my kitchen-aid attachment to shred the apples. i have had the attachment for over four years.